A lot of facial creams and serums are touting the fact that they are “Botox in a Jar”. Even Dr. Oz. has suggested that some serums and creams containing muscle relaxing peptides can be used as a Botox alternative. These serums will improve fine lines and wrinkles and relax and smooth but do not mimic the effects of Botox exactly. What are Muscle Relaxing Peptides? Peptides, such as acetyl hexapeptide 8, are becoming a common ingredient in many anti-aging skin care products. This peptide, which is created synthetically, is also commonly known as Argireline and may be listed by either name in a skin care product’s ingredients. Argireline is a needle free ingredient that is used in skin care serums and creams. It is simply a shortened strand of Botulinum toxin, more commonly referred to as Botox. When it comes to fine lines and wrinkles on the face, especially around the eyes and mouth; they usually form because of repeated facial expressions, such as smiling, frowning, or furrowing the brow in deep concentration or frustration. When people make these expressions, the face contorts based on the contraction of the muscles beneath the skin. When applied topically, Argireline suppresses the body’s ability to release neurotransmitters (The chemicals that allow the cells in your body to communicate with each other) in the affected patch of skin, allowing your muscles to remain relaxed for extended periods of time. In doing so, Argireline greatly reduces your chances of developing wrinkles and expression lines. Unlike other peptides, which are commonly used to boost collagen production in the skin and increase the skin’s moisture retaining abilities, acetyl hexapeptide 8 works to reduce the appearance of fine lines and wrinkles by restricting certain nerve impulses and relaxing the muscles in the face. When these muscles are relaxed, the frown lines between the eyebrows, crow’s feet around the eyes, forehead wrinkles, and even smiles lines become smoother. If you’re considering ways to remove wrinkles, such as frown and laugh lines, then this peptide may be an option for you, though it is not likely to eliminate deep forehead wrinkles or other significantly pronounced lines. While some companies that include acetyl hexapeptide 8 in their products claim that this peptide creates “Botox in a jar,” it does not mimic the effects of Botox exactly. What Peptide-based Product Should I Use to Relax My Wrinkles? Not all skin care serums and creams containing acetyl hexapeptide 8 are the same. In order to get the best end result, consider a medical grade product that contains acetyl hexapeptide 8. Medical grade products contain higher doses of this peptide as well as superior delivery systems that allow the product to penetrate deeper into the skin. Medical grade products also pair this peptide with other medical grade strength anti-aging ingredients so that you not only get a reduction in muscle contraction but also more collagen rich skin that is tighter, firmer and brighter. Our H&H Science Facial Firming Therapy contains the highest level of acetyl hexapeptide 8 as well as two other medical grade peptides to diminish the appearance of wrinkles and fine lines. It also contains antioxidants and herbal extracts that include Macrocystis Pyrifera Extract for immediate tightening, firming and toning. It also regulates and maintains moisture balance as a result of the high dose of hyaluronic acid, which has been touted as the “world’s best humectant and natural emollient.” It immediately holds 1,000 times its weight in water as soon as it is applied to the skin. Expect and demand more from your skin care products. Invest in medical grade treatments that produce results. How Do I Use My H&H Science Facial Firming Therapy? Your H&H Science Facial Firming Therapy should be used in conjunction with your daily skin care regimen. Your daily skin care routine should always include a sunscreen, retinol serum, vitamin c treatment serum and brightener. 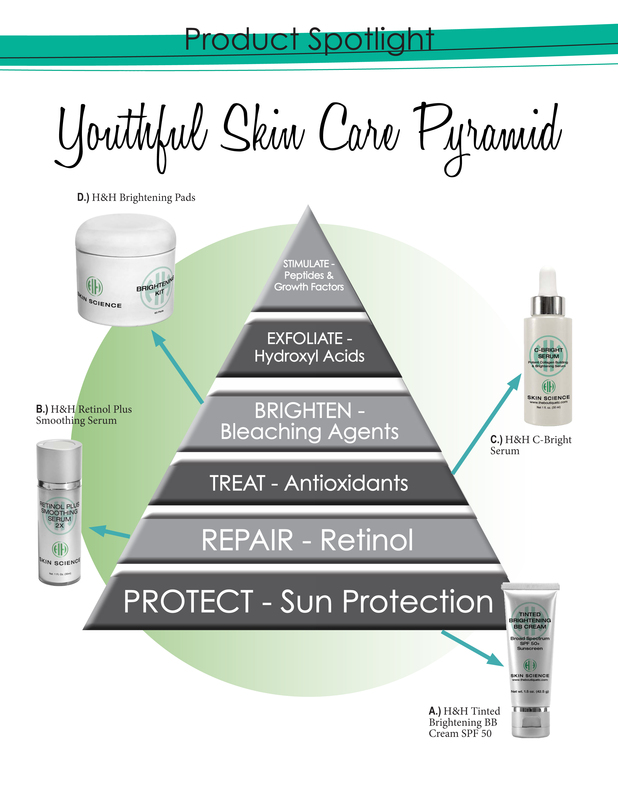 Please refer to our H&H Science Youthful Skin Care Pyramid to learn more about the skin care essentials. The H&H Science Facial Firming Therapy is a booster that you add to your essential skin care regimen to specifically target and relax fine lines and wrinkles. The H&H Science Facial Firming Therapy can be applied after cleansing and toning your skin in the morning and evening. Apply a pea size amount onto your fingertip and apply to the desired treatment area using a circular motion. Can I Use the H&H Science Facial Firming Therapy and Get Botox Treatments? The H&H Science Facial Firming Therapy can be used alone to relax fine lines and wrinkles by decreasing muscle contraction or it can be used in combination with your Botox treatments. In addition to relaxing facial muscles, it also contains other peptides and anti-aging ingredients to treat the skin by tightening and toning and building a more collagen rich dermal matrix. This cannot be achieved through Botox treatments alone. Botox treatments are focused on providing a complete relaxation of the facial muscles. The H&H Science Facial Firming Therapy is the perfect partner product to your Botox treatments. Using the H&H Science Facial Firming Therapy will enhance the results of your Botox treatment and increase the longevity of your results. I recommend the H&H Science Facial Firming Therapy and our H&H Science Skin Care Essentials Products to all of our patients who receive Botox treatments at our practices. What Results Should I Expect From Using My H&H Science Facial Firming Therapy? As soon as you apply your H&H Science Facial Firming Therapy, you will experience the benefits of the hyaluronic acid. It will instantly draw moisture to your skin and your skin will appear brighter and more quenched. The herbal extract, Macrocystis Pyrifera Extract, will provide an immediate tightening and toning effect. Over time, you will experience the benefits of the muscle relaxing acetyl hexapeptide 8. Fine lines and wrinkles will improve over time as you continue to use the product. Additionally, you will receive and enjoy the benefits of a more collagen rich skin appearance from the additional antioxidants that are included in this product. Botox injections should be used for deeper wrinkles and for a complete relaxation of facial muscles. The H&H Science Facial Firming Therapy should be used in conjunction with your cosmetic treatments. Think of it like going to the dentist, you go every 4-6 months for a professional cleaning, and then brush your teeth every morning and evening. Your H&H Science Facial Firming Therapy should be used every morning and evening to soften muscle contraction. Then, every four to six months, you would visit one of our cosmetic skin care experts at Trillium Creek for your Botox treatment.